When you think of the arid steppe of the future Patagonia National Park, it’s difficult to picture an environment with colorful tropical birds. That is what makes the Patagonia region so spectacular though, it’s full of the unexpected. Witnessing a flock of brightly colored Austral Parakeets flying through the grasslands of Valle Chacabuco feels a bit otherworldly. It’s a similar sensation to seeing the Chilean Flamingoes fly overhead; where did these birds come from? The Austral Parakeet or if you’re up for a mouthful, Enicognathus ferrugineus, is part of the parrot family. 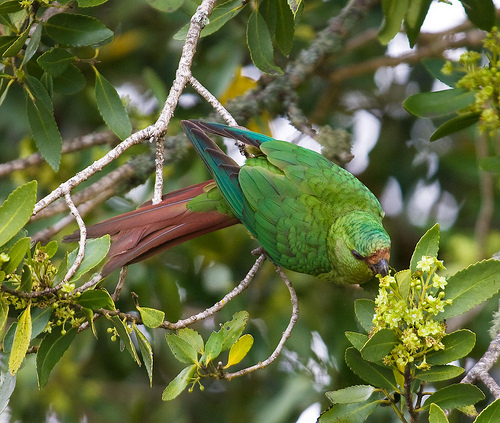 These vibrant birds live further south than any other parrot in the Americas and are one of the few non-tropical parrots. They prefer to live in mostly wooded country, but are also found in shrubland and grasslands; making the future Patagonia National Park a perfect home. The grasslands in Valle Chacabuco offer ideal feeding grounds where they eat seeds, grains, and fruits and the neighboring Southern Beech forests provide for the perfect roosting sites. The birds are “cavity-nesters” meaning they usually settle in tree cavities. They don’t only use the Southern Beech forests for nesting though; you can also find the birds feeding on the tree’s leaf buds and seeds. Southern beeches are fundamental to the bird’s existence and vice versa, the Austral Parakeets are vital to plant regeneration, acting as great dispersers for the Southern Beeches and other Patagonia Flora. Similar to the rest of the parrot family, Austral Parakeets are monogamous breeders, staying faithful to their chosen mate. At any given time you can see the lovebirds flying side-by-side throughout the future Patagonia National Park. The devoted duo remain close during breeding and non-breeding season. Females lay anywhere between four and eight eggs each clutch. The females incubate their eggs for three weeks, rarely leaving the nest. Subsequently the male is on feeding duty, continually visiting the nest to feed his companion – now that’s teamwork! 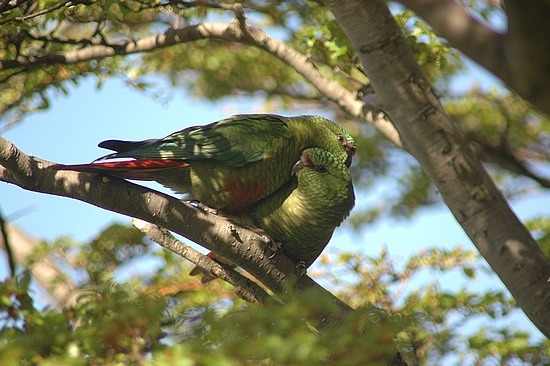 Not only are Austral Parakeets romantics, they are also very social birds. A typical flock consists of 10-15 individuals, but seeing a flock of 100 individuals is commonplace during feeding when the birds become most gregarious and even feast with mixed-species groups. Just like a normal family dinner, Austral Parakeets tend to talk over one another while eating: click here to listen to their group chatter. The Austral Parakeet is suffering from population declines due to deforestation, competition with non-native species, and human captures for pet trade. It is important for us to realize these beautiful and intelligent birds do not exist for human entertainment. They are happiest in their natural habitat, which embodies lush forests and wide open spaces, not an enclosed bird cage. 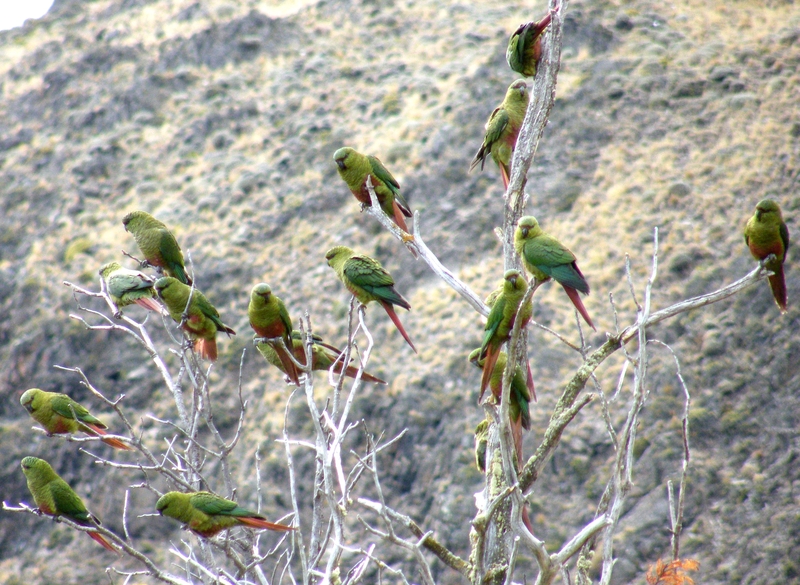 Fortunately, within the future Patagonia National park, Austral Parakeets will have the freedom to soar from the lowlands of Valle Chacabuco to the highlands of the Andes Mountains.